InLoox PM 7 saves storage space and avoids duplicate records simultaneously. As the software works with file and object links, documents are not saved in Microsoft Outlook and Exchange Server. On the Edit page, in the Edit, click New. 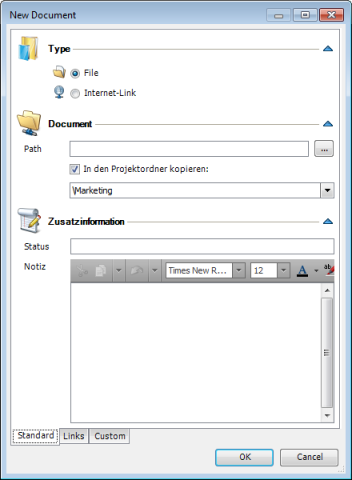 On the Document area, in the Path box enter a path or internet link. Select the Copy to project folder check box. In the drop-down list choose a subfolder, in which you want to copy the document. In the Additional information area, in the Status field enter instructions, e.g. complete or awaiting release. Add the document via Drag and Drop. How to add and edit documents in InLoox PM 7 • Copyright 1999-2019 © InLoox, Inc. All rights reserved.